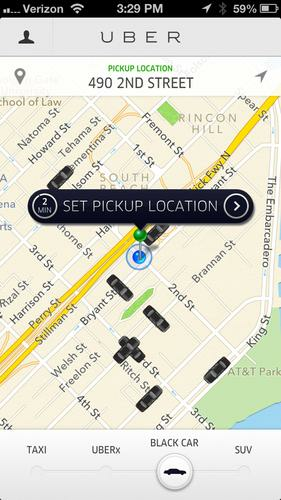 Judge says UberPop's smartphone app is provoking a rapid growth in illegal taxi services. A judge in Milan banned UberPop in Italy on Tuesday, ruling that the car-hailing service constitutes unfair competition for taxi drivers. Judge Claudio Marangoni said a complaint lodged by taxi drivers' associations and trade unions was well-founded and the UberPop smartphone app linking private drivers with passengers is provoking a rapid growth in illegal taxi services. Marangoni gave San Francisco-based Uber, which controls a global business estimated to be worth around US$40 billion, 15 weeks to comply with his order or face a fine of €20,000 (US$22,000) per day. Uber had indicated it would appeal a negative ruling and seek to change Italian and European regulations that affect its operations. UberPop drivers are able to charge tariffs that are significantly lower than those charged by regular taxi drivers, Marangoni said in his ruling. Uber has led an uncontrolled increase in driving services on offer and unregulated drivers have not been required to offer their services at times of low demand, as is the case with official taxis, giving the Uber drivers an unfair commercial advantage, the judge said. Making a request for a ride using a smartphone app is "perfectly similar to a radio taxi service," Marangoni wrote in his ruling, which has the effect of suspending Uber activities throughout Italy. "It's a great victory, and we didn't do it just for ourselves and our work, but also for the safety of users," said Pietro Gagliardi, a taxi trade union leader from Milan. Giovanni Maggiolo, another trade unionist, noted UberPop had been suspended for similar reasons in France and Germany. "Uber uses workers who don't receive social security and pension contributions," Maggioli told reporters. The consumer organization Codacons said it was disappointed by the ruling, which it branded "a medieval limitation on competition." The ruling damaged users by limiting competition and restricting consumer choice, Codacons President Carlo Rienzi said in a press release. Rienzi condemned the ruling, saying that it was unimaginable to deprive a modern country of efficient and innovative services such as Uber. Uber drivers have been fined and had their vehicles seized in Milan, Turin and Genoa and, on occasion, have been subjected to verbal and physical attacks by taxi drivers. One Uber driver admitted recently that he advised customers to embrace their driver on leaving the car, so suspicious taxi drivers would assume they were related. Speaking before the ruling, an Uber representative in Brussels said he was confident that the Italian and European parliaments would press ahead with the liberalization of services, including transport. Experience in the U.K. has shown there was room in the market for everyone, Mark MacGann told La Stampa newspaper. "The client who takes an Uber car wouldn't take a taxi anyway, because it's too expensive. Public car services doesn't just mean taxis. There's room for Uber too," MacGann said.